Both Reshade and the 21:9 UI fix have d3d9.dll files. Unfortunately, that doesn't trigger Reshade in-game. I would very much like a way to make these two d3d9.dll files work together, if anyone has any possible fixes to suggest or has gotten Reshade and the 21:9 UI fix to work together and can share what they did to achieve that, I would be incredibly grateful. Below is a screenshot of what my Dragon's Dogma Dark Arisen folder currently looks like. 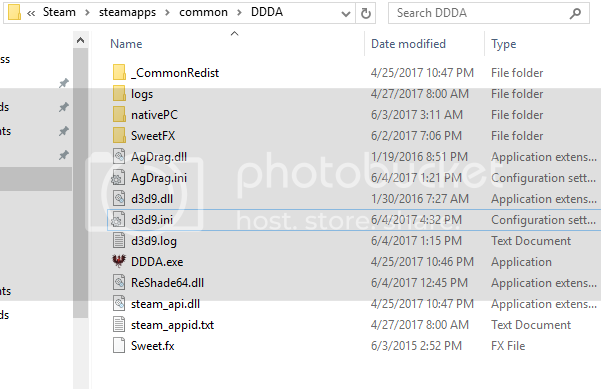 I did notice that when applying Reshade to Dragon's Dogma, there was a d3d9.dll file added, but there wasn't a d3d9.ini file that was added; the only d3d9.ini file I have is from the 21:9 UI fix. Is it possible my d3d9.ini file is missing something important? Use an injector for one. Thanks for your reply! I actually somehow got it working with the two d3d9's, I must have messed something up the first time but now it's working with renaming one dll and adding the appropriate setting to the d3d9.dll. Thanks again!